Oh boy, I am in the middle of the Anthony Robbins "Ultimate Edge...blah blah blah..." - its good, really, I mean it and someday I want a place on Fiji right next door. So what better way than to study the dude. Perhaps you don't know Anthony Robbins or what he does - in a nutshell, he helps point out the obvious to the oblivious. He sounds sincere, is the consummate selling professional - always closing - and makes an impression. He attracts - I guess that is one reason he has 'handlers' - huh. Well, the material I am visiting is dated and timeless pointing out how so unaware we walk through Life. The waning days of Summer 2011 entice a review of my journey these last 90, a Quarterly Review of sorts - who says our clients should be the only one's to get QBRs? This summer has been about breaking through the Stage 1 and Stage 2 - wait, that's not 100% - before I could break through, I needed to 'remember' Stage 1 and Stage 2...so yes, now I see S1/S2 completely. Table stakes. Temporary. You can really change, by letting go the restrictive patterns of our past and you can't let anything go until you remember. MpS changes all of us, by making us aware, helping us remember. Anyway, this summer has been about integrating an MpS Practice into a VAR/MSP's Infrastructure, recognizing End-User's behavior, and Re-Imaging. Interesting thoughts. Everything starts with a thought. Now I know, when a real MpS practice is created and managed into profitability, the same talent that built and supported the practice can effectively and profitably run a Managed Services Practice. There, I said it. Monitoring and servicing storage vs.copier and output devices is a snap. Applying ITIL to output devices is a no brainer. Dispatch, triage, escalation are part and parcel of every dealer's pedigree. Engineers are cost centers when they sit on the bench. Service technicians reduce cost through call avoidance. Big difference. We have trunk stock, they order and CHARGE for parts as they go. Trip fees sometimes represent profit as most of the agreements are pretty much "we agree to charge you the least, and you can go anywhere you want if we don't..." types. Recurring billing is asset or seat based, not usage - this is a huge difference that flows from sales to billing. If the MS software does not consider usage-billing, meter reads and billing is 'duct-taped' together. Back in May, a fellow blogger took exception to my little blogging universe attacking me and my readers. While this negative move was regrettable, apologies were extended and accepted. The world turned, it always does. Out of the ruckus, opportunities revealed themselves - I accepted a paying gig with The Imaging Channel. And in a reversal of fortune, I will be blogging over at the Business Transformation Center on Everything Channel. Quite delicious, indeed. 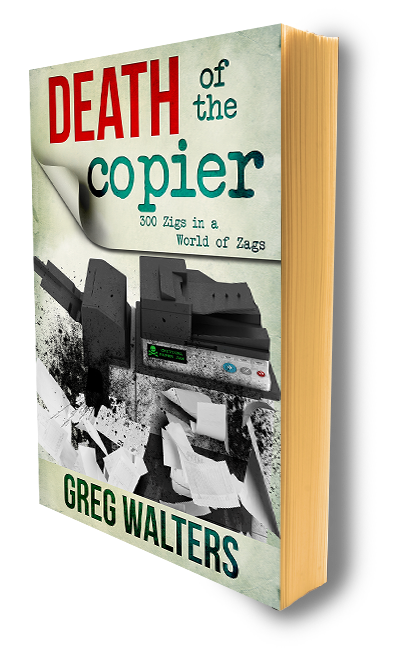 The Death of the Copier book is now a real, honest, work in progress - release date is scheduled for Halloween. It worked for Orson and his "War of The Worlds" so why not. And finally, the DOTC Members Only support group is being launched. More Greg, more DOTC and more you. "... a group of like-minded members; folks who know there is something more to selling than 30 day cycles, sales funnels, rip and replace, flexing and cold calls..."
Oh the fun we shall have. All the above, a result of natural progression in my continuing effort to "re-image" and re-imagine. This journey is incredible. Thanks for walking with me. My latest zig, while the rest zag, is fixated on the end user - more specifically, why do we behave the way we do? There is a reason for our umbilical-like relationship with paper. What is that reason? So I decided to expand upon my already mundane PrintSolv reports and dig a bit deeper into how the volumes are generated, why do people print, what does our real behavior look like. Enter Behavior Modification software - BeMod. Just last year I was vehemently opposed to the 'hammer or feather' approach - I still dislike pop up bubbles. But there is gold in there. The gold is transparency, revealing what was right in front of us all along, hidden. What are we printing? How often, how many pages per job, color, duplex, emails, internet, .ppt's. More than volumes - simply, More. This visibility reveals trends, characteristics and for me, End User Print Profiles(EUPP) emerge. I've already used this approach legitimizing a Ricoh copier over a small collection of MFPs - MpS Purity. BeMod is the bridge between S2 and S3; S3 opens to S4 and beyond. The realm beyond the MIB is galactic in scale. Nobody prints out there. "The Things We Think and Do Not Say. The Future of Industry"